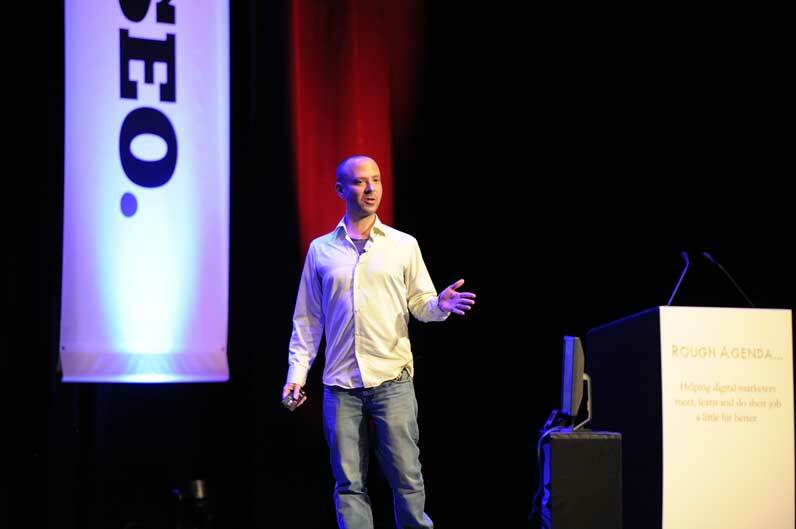 BRIGHTON, England — I had the honor of speaking at BrightonSEO last week for log analytics startup logz.io, and it was a pleasure to meet the British digital marketing community for the first time! For those who were not able to attend my talk, I have included my deck and notes below. Let me tell you a story. Mason Wartman was a 26-year-old trader on Wall Street in Manhattan. But he was not happy — his dream had always been to run a pizza parlor. He saw the success of $1-a-slice places in New York City, and he wanted to do the same in his hometown of Philadelphia. Rosa’s Fresh Pizza was born. One day, a customer asked if he could buy a slice for a homeless person who was outside. Then, Mason had an idea. He invited customers to “pay it forward” by offering to buy future slices of pizza for people in need. If someone would give $2 for two slices, Mason would put two post-it notes on the wall. Then, anyone could enter and take the two post-it notes and redeem them for two slices. The idea took off, and the pizza parlor’s wall was soon covered with post-it notes. Customers told their friends and family. And the friends and family members told their friends and family members. And so on. Eventually, the local media heard about what Mason was doing, and they wrote stories about it. Soon, Ellen Degeneres learned about it, and she brought Mason on her daytime talk show. All of the media attention resulted in links that are 100% natural and 100% authoritative. Years ago, I did all of the traditional linkbuilding practices that SEOs tend to do. I did directory submissions, article spinning, linkbait, e-mailing people to ask for links, and so on. Then, I read the linked article by Everett Sizemore — and a lightbulb went off in my head. Links are actually just by-products of good marketing and public relations! In the end, the best marketing is just telling good stories — just as it was in my prior career in journalism. KPI (key performance indicator) identification — What do you want? More app downloads? More B2B leads? More B2C sales? Audience identification — Who is your marketing targeting? It might be teenage boys, middle-aged mothers, senior citizens, or something else. Media outlet research — What publications, websites, and blogs does your target audience read? Who are the specific writers at those outlets who would be most interested in you and your story? Messaging & positioning — How will you “sell” your company and product to those journalists, bloggers, and websites to convince them that you are newsworthy, interesting, and important? Pitch & press release creation — How will you communicate the positioning and messaging while talking with those reporters, bloggers, and outlets to convince them to cover you? So-called “outreach” is just doing PR by another name! The power of PR is enormous. At a prior agency, we had a client who hired us first for PR and then SEO a month later. A couple of weeks after the PR work started, the website jumped from nowhere to the top of page two in the search results — long before we had even touched the website. Here is just one example of what a good PR campaign can accomplish. If you do real marketing instead of linkbuilding, you will never have to worry about Google Penguin because the links will be 100% natural — you will not have done anything to obtain them directly. The distribution of Domain Authority in your backlink profile will be natural — as will the distribution of anchor text. The subtext of this quote from Rand Fishkin of Moz is that Google is an algorithm that wants to think like a human being — marketing “to Google” and marketing to human beings is increasingly becoming the same thing. Here’s an example: For the search query “best brighton restaurant,” Google does not want to show the top ten sites based on keywords and links. Google wants to show the ten sites that the human beings who live in Brighton actually think are the best restaurants. Let’s stop building links and start building brands!